This is for you Torsten, Simon, Norman, Marc, Kai, Danny, Janice, Matthias, Maik, Filiz, Jana, Christian, Christian and Nicole: a huge thanks from a regular DB traveller for helping to make my journeys a little more manageable and pleasant. For those of you reading this that are not regulars on either Twitter or German railways, the Twitter account @DB_Bahn is the place where travellers can ask for advice and assistance about anything and everything relating to Deutsche Bahn. Info on service updates, delays, suggestions, you name it they can provide it, and provide it fast. While they (sadly) cannot actually make sure the trains run on time, they do at least provide more information that it is sometimes possible to glean in the station or on DB’s website, and do it in a cheery way. In the past I’ve received help a number of times from them concerning replacement trains, what to do when a storm blew trees onto the line, how to book tickets for an Austrian Railways train that started in Germany, and information about whether my train would manage to pass a bridge that had been hit by a truck. 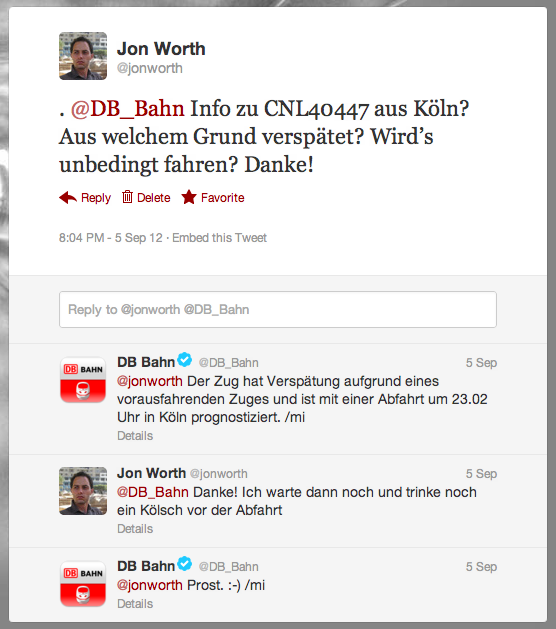 Above all @DB_bahn helps provide the information and reassurance so often lacking when travelling by train. They are there to help and – in my experience – really strive to do so. Vielen herzlichen Dank!